Kruja (also known as Krujë) is a small and picturesque town in the mountains of Albania, about 30km north of Tirana. The main reason to visit this place are the ruins of the castle of Kruja, a historical place where the Albanian army with limited garrisons managed to withstand three massive sieges from the Turks between 1450 and 1467 under the command of Skanderbeg, the Albanian national hero. 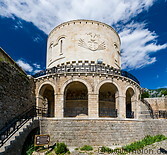 Nowadays only ruins are left of the original fortress, but a modern museum, the Skanderbeg museum, has been built on the site of the former castle. Kruja itself is a pleasant small town, a bit touristy, with a large bazaar below the castle and a number of cafes and restaurants. It is possible to visit Kruja as a daytrip from Tirana by bus (45 min.) or by car. 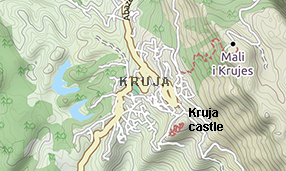 For those who choose to stay in Kruja, there are a few hotels in the city, easily bookable via online portals.